Yes, please send me marketing emails! "Since moving to Shoptimized, we have seen conversion rates double from moving from our old theme to Shoptimized 3.0 and then conversions doubled again after the 4.0 theme roll-out. Best product page layout, urgency features, and social proof features I have seen on any theme, plus support is great for any tweaks that need to be made. Shoptimized is a huge reason our main store was able to do over $600K in sales in our first 8 months. Zach V."
"Shoptimized is hands down the best theme on the market." 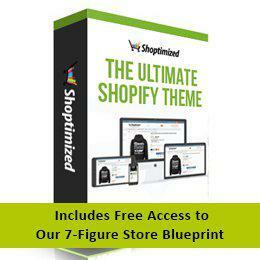 This license entitles you to 3 private licenses to the Shoptimized Shopify Theme. This license is non-transferable, can not be sold, shared with other store owners, traded or given away. You may use this theme on any 3 Shopify stores that you own. By downloading the Shoptimized Theme you accept it is a digital product and is therefore non-refundable. Fraud Declaration: In the event that you submit a Paypal dispute or chargeback with your credit card provider, your acceptance of these terms and your IP address will be submitted as part of our response.